Symfony 4 was released in November 2017, alongside new best practices and Symfony Flex, the new way to manage Symfony applications. 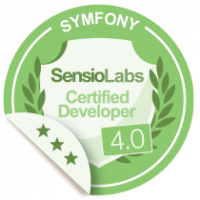 This new version is so different from Symfony 3 that we've decided to introduce a new Symfony 4 certification program. The Symfony 4 exam consists of 75 questions to be answered in 90 minutes or less and you can take the exam in any of the 4,000 test centers available worldwide. The list of topics covers the most important parts of the core framework, excluding third-party libraries like Doctrine, Monolog, etc. Depending on your results, you'll get the Advanced Certified badge or the more difficult Expert Certified badge. You can buy your exam voucher today and take the exam up to one year later. If you already have a voucher for the Symfony 3 exam, you can use it for the new Symfony 4 exam as long as you haven't activated the voucher and made an exam appointment yet. If you have any question, contact with us. When will the training be available ( For Symfony 3 : https://training.sensiolabs.com/fr/courses/SF3C6-preparation-a-la-certification-symfony-en-elearning-sensiolabs-university ) ?